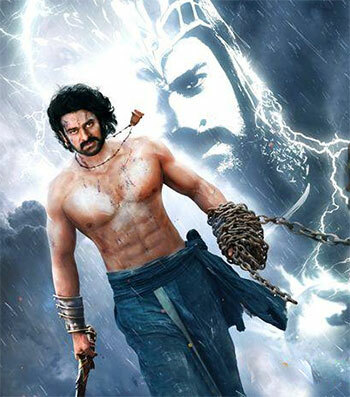 Rediff.com » Movies » The Baahubali story is not over... yet! 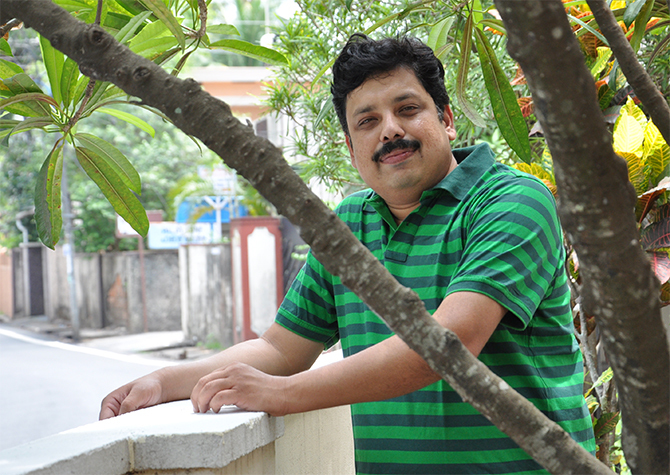 An international television series is on the anvil, says Anand Neelkantan as he shares the challenges of penning The Rise Of Sivagami with Rediff.com's Savera R Someshwar. IMAGE: "Rajamouli Sir was very clear the tale had to be told from Sivagami's or Katappa's point of view." If your phone rang and the voice on the other end identified itself as belonging to S S Rajamouli, the director of that lavishly mounted moneyspinner, Baahubali, you'd probably be forgiven for thinking it was a prank call. Even if you were one of India's popular authors. The author of the well-received Asura: The Tale Of The Vanquished, Ajaya: Roll Of The Dice, Ajay: Rise Of Kali and the recently released short story, Bhoomija Sita, thought it was a friend with a little too much time on his hands. But things got serious, soon. An affirmation of interest on e-mail from Rajamouli's office followed, along with a flight ticket to Hyderabad. What happened next was not something that Neelakantan did not expect. He was put to the test, a test that would be carefully graded by a "master storyteller". Stacked on Rajamouli's office table were pages and pages -- over 2,000 in all -- that contained detailed profiles of the main characters in Baahubali. There was enough material there for a book, or two or three, and Rajamouli -- who had enjoyed reading Neelakantan's Asura -- was looking for a prequel book series to his two-part mega movie, something he could spin off into an international television series. As Neelakantan dashed off 20 scenes in two hours -- "I am a very fast writer," he says -- his experience with television -- Siya Ke Ram, Chakravartin Ashok Samrat and Sankatmochan Mahabali Hanuman -- kicked in. 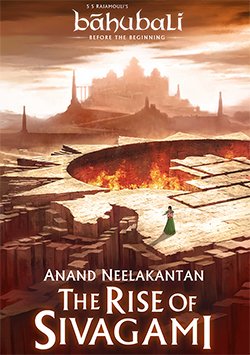 The result of that phone call, and passing Rajamouli's test with flying colours -- The Rise Of Sivagami -- is now in bookstores. Didn't having his writing rated on a scale of one to 10 bother the author? "My work gets rated every day," he says. "I have got almost 10,000 reviews on (the Web site) goodreads. So why not get rated by a master storyteller?" IMAGE: "Katappa and Sivagami are my favourite characters in the movie." It was exciting to be invited into the privileged world of Baahubali. "It's a huge brand, both financially and in terms of popularity. More importantly, Rajamouli Sir has given six or seven years of his life to it; as have 2,000 to 3,000 other people who have worked on the movie." "They definitely had to take precautions to ensure they were not bringing in someone who would dilute the brand." There was the added incentive of knowing -- last year itself -- the answer to that burning question... Why did Katappa kill Baahubali? But he could not share that information with anyone, not even his wife. Now, all he had to do was choose his book's protagonist. The self-titled counter-teller of mythologies -- his previous books Asura and Ajaya look at India's twin epics from the point of view of the losers, Ravana and Duryodhana -- seemed to be taking a different track. "Why not? I haven't taken a vow or a promise that I will write from the villain's point of view only," he smiles. "If you look at the television series I have written... Ashoka was from Ashoka's point of view, Siya Ke Ram was from Siya's point of view and Hanuman was from Hanuman's point view." Besides, he points out, he was commissioned to write the book for the Bahubali franchise. "One of the first things Rajamouli Sir jokingly told me was, 'Don't make Bhallala Deva or Bhijjala Deva the protagonist. All my work should not go waste. Don't make them heroes," Neelakantan laughs. In fact, "Rajamouli Sir was very clear the tale had to be told from Sivagami's or Katappa's point of view." IMAGE: In Anand Neelkantan's latest book "Sivagami begins her journey from somebody who wants to destroy Mahishmati to someone who becomes almost the mother goddess of Mahishmati." It was not a restriction that worried Neelakantan. "Katappa and Sivagami are my favourite characters in the movie." "Strength," he answers in a word. Is Sivagami his favourite in the book as well? "Not yet. Because she is just evolving. She is a confused character; she is just finding herself." "In The Rise Of Sivagami, I like two people. I like Pattaraya, because he an example of how an ideal man should live, and Skandadasa, who embodies how an ideal politician can live. These are both extremes, both colours of life." But before he could choose his favourite characters, he had to create them. And he had a deadline... 100 days; a deadline, he confesses, he missed by nine days. Neelakantan stepped back from all the other projects he was involved in -- his television serials and a book that was almost ready. "This was Baahubali after all," he says, much like a fanboy. He populated Mahishmati with 40 new characters, including a very young Sivagami and a very young Katappa. He made one an orphan and gave the other a father and a brother. He created a new vocabulary using the languages he speaks -- Malayalam, Tamil, Kannada and Sanskrit. And he made Sivagami hate Mahishmati. "Otherwise what is the story? Sivagami loves Mahishmati? There is no story in that. I have to write 2,500 pages (in the three-part series)." So the Sivagami in Book 1 (left) wants to destroy Mahismati; she just does not know how... yet. "She does not know whether her father, who was sentenced to die by the king, is right, or whether the king was actually right. She just knows it is the king, and his kingdom, who have destroyed her happiness so they, in turn, must be destroyed. So she reaches a position of power for which she might have to pay a big price." Thus, in The Rise Of Sivagami, begins "her journey from somebody who wants to destroy Mahishmati to someone who becomes almost the mother goddess of Mahishmati." It's not an easy journey that Neelkantan has plotted for her. Or, for that matter, for Katappa. In fact, it has not been an easy journey for Neelkantan either, for the boundaries within which he had to create his story in had already been set, and loved -- if one goes by box office figures -- by millions of Indians. "Everyone knows how the story will end," he says. "That can't change. Nor can the basic nature of the characters, be it Sivagami or Katappa or Bijjala Deva." "Katappa has to behave in the way he behaves in the film. Sivagami can only end up as a strong woman. My challenge is to make the journey till that end as interesting as possible." The second book in the series is scheduled to release in the last quarter of the year, while the final one is expected to release mid-next year. And that is just the beginning of their journey. 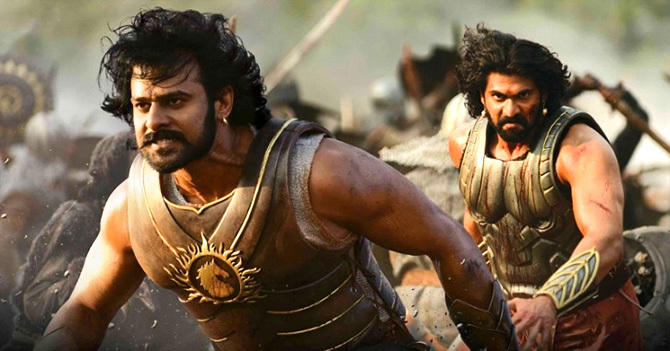 For this trilogy is the foundation for an international television series, part of Rajamouli's plan to increase the longevity of the popular characters he has created. "Rajamouli Sir wants to take it beyond India," says Neelkantan. "So it will be in English, and in Indian languages. The channel is yet to be decided -- it could be on Amazon or Netflix or HBO." In the meanwhile, two more books need to be written. The pressure, he says, is tremendous. And not from "Rajamouli Sir." His earlier books -- Asura: Tale of the Vanquished, Ajaya: Roll of the Dice and Ajaya: Rise of Kali -- were "highly successful". There was his fan base. "They have a certain expectation from my books, but I could not write this book only for them. The Rise Of Sivagami had to go beyond that. It had to cater to all kinds of readers without compromising on the quality of the writing." The Rise Of Sivagami had to lend itself to television -- that was part of the brief. "So the writing had to be visual. The story had to move quickly. You cannot hide behind lyrical prose. It needed complexity but it had to be told in a simple manner." More importantly, it had to match the "film's grandeur." Most importantly, his children finally "excited about what Appa is doing. Otherwise, writing is just Appa's routine job." IMAGE: "Baahubali is a simple story, spectacularly told." As a writer, as a creator of worlds, how does he analyse Baahubali's spectacular success? 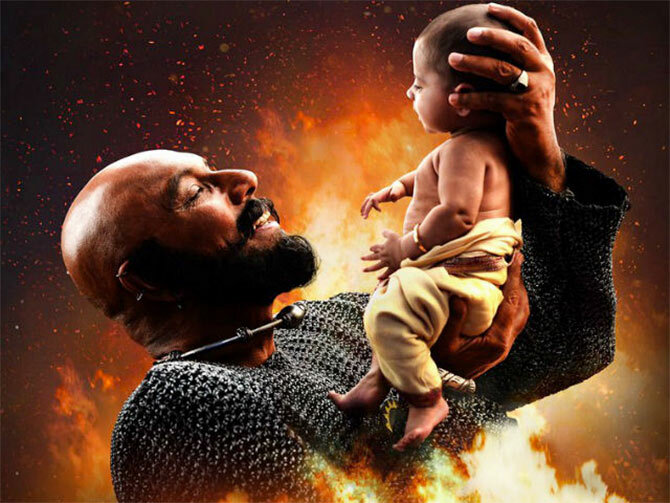 Why did people succumb to the experience that S S Rajamouli offered through Baahubali? "Baahubali is a simple, Amar Chitra Katha kind of story, that has been spectacularly told," says Neelkantan. "It is a very difficult balance to achieve. There are many writers who can write complicated stories that will appeal only to a small set of people. The truth is: All great stories are simple stories. What is important is how you tell them." He has taken the first step. The first book is out and "Rajamouli Sir loved it." And that's left Neelkantan terrified. "The next book has to be pacier. As for the third book, I don't know what I will write and how it will tie into the movie..."